JH-DN31032C, is a D-node device (commonly known as all-in-one). Adopting the design concept of modularization, zero configuration, intelligent management, and simple maintenance. 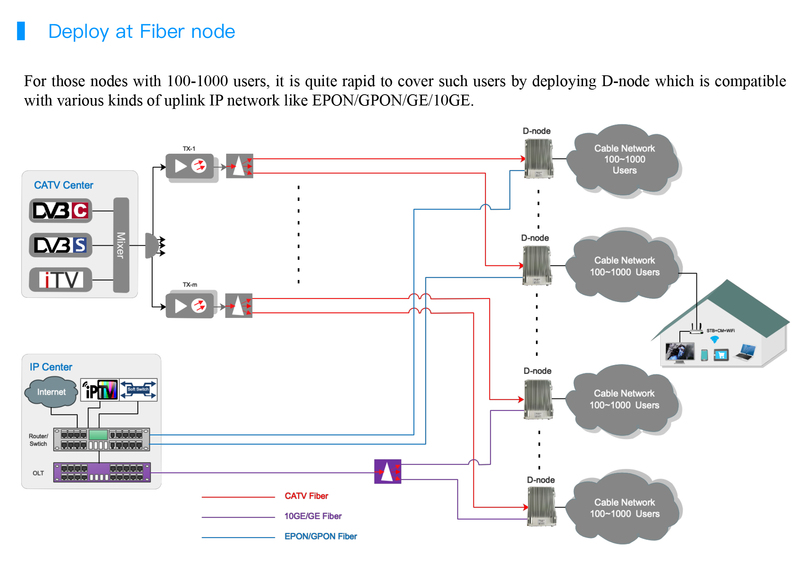 It is deployed in the fiber node, making the fiber node become the transmission path of the integrated service, thus greatly simplifying the network structure. D-node has built-in CMTS module, CATV optical receiving and amplifying module, ONU module (optional), etc.. These modules can be replaced separately. Jinghong also creatively increased the spectrum analysis module, so that RF signals can be fully spectrum real-time monitoring. The NMS can automatically monitor the working status of each module, automaticallly analyze and locate the faulty module, and alarm or notify maintenance personnel to replace it at the site. The basic service of cable operator has stable and reliable guarantees. JH-DN31032C has four high-level output ports with a frequency range exceeding 1 GHz, which can completely replace the original optical receiver. It can flexibly adapt to 10GE/GE/GPON/EPON networks through matching modules such as SFP+/SFP/OTU/ONU. The built-in CMTS module is bundled with 32*10 DS channels, and the 2Gbps data rate is sufficient for the user's big bandwidth requirements. JH-DN31032C is compact and waterproof to accommodate varies installation environments. Its excellent transmission capability, combined with intelligent management software, can meet the NGB requirements of cable operators. The D3-C series are the third generation of Jinghong DOCSIS 3.0 CMTS platform. There are various product forms build for indoor, outdoor(D-node), mini front-end and modular type to meet various deployment scenarios. Compared with its predecessor, the D3-C series are equipped with the latest MAC/PHY chips and an upgrade, more powerful Broadcom multi-core network processor. D3-C series have doubled the bandwidth, while maintaining all features from its predecessor. It can support 1000 CMs online simultaneously. Bundled with 32 QAM channels for downstream (sharing one RF port), the data rate can reach up to 2Gbps. The downstream can be easily configured as data channels or IPQAM channels. It also supports multicast capabilities. 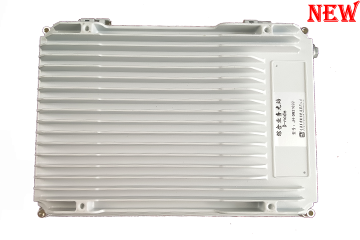 Bundled with 10 QPSK/QAM channels for upstream (sharing one RF port), the data rate can reach up to 400Mbps. It alse provides the upstream spectrum analysis function. D3-C can run in L3 or L2 mode. It has perfect QoS mechanism, built-in DHCP/TFTP/ToD servers, supports DHCP relay, and supports IPv6. It can be adapted to varieties of operation environment for different requirements. There are three ways to manage the D3-C series: 1) Login through Telnet on the local machine with command line (CLI) for configuration management; 2) Embedded Web mode which can be remotely connected; 3) Network management software based on SNMP protocol which supports network management software from third parties. D3-C series are compatible with DOCSIS 3.0/2.0 standard cable modems, as well as cable modem built-in the set-top box, eMTA and other terminal equipment. ◆Based on the mature DOCSIS3.0/C-DOCSIS standard, Support the evolution to DCAP and CCAP structures. There is no investment risk. ◆Modular design, zero configuration application, intelligent management, simple maintenance. ◆It overcomes the defect that the traditional CMTS can only be deployed in the headend, and greatly reduces the "funnel noise" interference. ◆Remote monitor, Remote maintenance, Remote update. ◆Low Coverage Cost, Low unit bandwidth cost. ◆It is an integrated compact device that can completely replace the original optical node equipment.